I neglected to put photo credit on the photo from yesterday’s entry. Although I did the post-processing, the photo was taken by my husband Emile. There is a bakery in town. It is called Schat Bakery. German or something. It certainly catches your eye as you drive down Main Street. In English, the name sounds like past tense of poop. Like all bakeries, I know it is there, but I do not often visit. They smell terrific but are like having 3 shots of vodka before grocery shopping. Suddenly you really need a cake a day for desserts. So with our fitness kick, I stay out of the bakeries. I can’t physically run as far as I would have to burn off all those calories. My in-laws are visiting and we decided to do some sight-seeing and shopping downtown. Looking for a fast and cheap lunch idea, I suggested the hotdog cart. Nothing like a hotdog or sausage on a beautiful summer day! My father-in-law looked at me and the cart like I suggested he scrounge for food in the gutters. Apparently, he has a problem with hot dogs. Or perhaps he was cranky due to lack of caffeine. Whatever it was, he wasn’t eating on the street. He was going to walk the six blocks to the closest Tim Horton’s and get a coffee. In all the times I have visited with people from Holland, it doesn’t matter how full you are, how sick of food you may be, you always have a sweet treat with your coffee. Always. Even if it is stale graham crackers from the back of the pantry. You have a sweet treat. And my in-laws are Dutch. We needed a coffee and a sweet treat. And no tubes of processed meat. Hoping to salvage this situation, I looked up and saw Schat Bakery across the street. On the window it said “Coffee/Tea”. We entered the cool shop and the lit glass display cases glowed. The signs for each item were in English and DUTCH! This isn’t a German bakery, this is a Dutch bakery. And I never knew. Not only had I steered my in-laws to wonderful hometown bakery, but a Dutch one! They even had a Dutch conversation with the proprietor. I am their favorite daughter-in-law again. July 8th, 2012 Extra-Ordinary: A Dutch Bakery, coffee and a oliebollen for all. We found ourselves in Gravenhurst today and I thought for fun we would head to Sobey’s to do our grocery shopping as it is the only one in Muskoka. The shoulder seasons are pretty quiet around here. You make your own excitement. I like grocery shopping and I like shopping at different places that offer different things. It’s fun in the US especially because they get all of those crazy products that you really shouldn’t eat in the first place. Sobey’s isn’t that much different from the other stores in the area – but I did find a nice tube of fresh roasted garlic purée. Dutch? 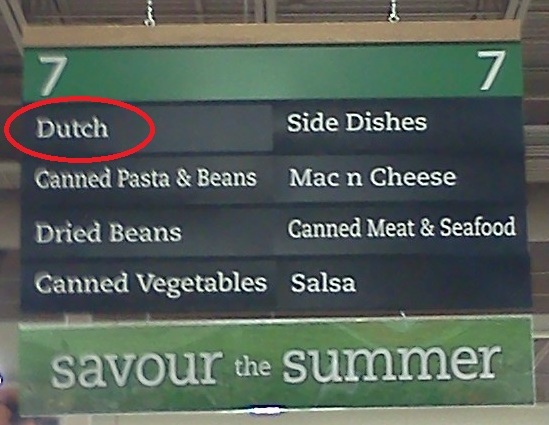 I mean, you get the Asian section, the Mexican section, and usually the “International” section, but I have never seen a Dutch section. Especially in a small town grocery store. Even in St. Catharines (where Emile grew up) if you want Dutch treats you head over the Dutch store, not the grocery store. We headed over to check this section out. It was a doozy! May 5th, 2012 Extra-Ordinary: Stroop Waffles, Double Salted Licorice, King Peppermints, Windmill Cookies and all sorts of Dutch treats at the grocery store.